According to scientists and various studies that were conducted on sea level rise due to global warming, the seas could be as much as a meter (3 feet) higher by the end of the century than what they are today. 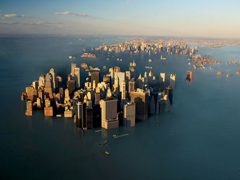 After that the impacts of sea level rise are projected to continue with a sea level increase of about one meter (3 feet) for every one hundred years. However, no one can confirm this for certain, as there are too many unknown variables, but what they are sure of is that the sea level rise is due to global warming, the dynamics of which are still poorly understood. The IPCC (International Panel on Climate Control), which is a global climate scientist partnership, came to a conclusion that over the next century there will be an average increase in sea levels between 19 and 89 centimeters. According to them, this is largely caused by anthropogenic global warming and is mainly due to thermal expansion. The localized changes in sea levels will vary greatly, according to the IPCC, but their overall projection is nothing short of disaster. The most vulnerable region for rising sea levels in the U.S. is the Gulf Coast (to read about oil drilling in the Gulf, click here), especially around Louisiana. The IPCC issued a recent report where the estimated sea level costs of one meter were going to be between $275 and 400 billion for the United States. In addition, if we don’t start taking the necessary measures, one increase of one meter (3 feet) of sea levels would result in losing about 14,000 square miles of the coast of United States. Among other areas under threat are mainly those located on Deltas, such as Bangladesh, Vietnam, and Egypt, where the population near the projected one meter sea level rise numbers 8-10 million. Some significant change in climate is already taking place in some of these regions. Moreover, there are half a million or so inhabitants on various islands around the globe that are especially vulnerable to the impacts of sea level rise. Some regions will suffer the effects a little differently via changes of marine ecology, like the market of fish and seafood. Regions like Shanghai, Sydney, and Louisiana are dependent on their fisheries economically. The impacts of sea levels rise could spell disastrous difficulties for communities that are based on the coast over the next century and beyond. Some major cities such as New Orleans and London are already requiring storm-surge defenses, and they would be in need of more because of the rising sea levels in the future. The impacts of sea levels rise is projected to also leave a lot of people homeless. For example, a rise of as little as 200 mm could leave about 740,000 people homeless in Nigeria. The Maldives could be left completely uninhabitable by 2100. Posted on October 10th under Global Warming Issues.